Acute pancreatitis refers to inflammation of the pancreas. It can be distinguished from chronic pancreatitis by its limited damage to the secretory function of the gland, with no gross structural damage developing. Acute pancreatitis has an increasing incidence, in the UK at around 30 per 100,000 each year with a regional variation. Mortality figures can range between 5-30%, depending on severity. Each cause described above will trigger a premature and exaggerated activation of the digestive enzymes within the pancreas. The resulting pancreatic inflammatory response causes an increase in vascular permeability and subsequent fluid loss into the third space (transcellular space, e.g. peritoneal cavity). Enzymes are released from the pancreas into the systemic circulation, causing autodigestion of fats (resulting in a ‘fat necrosis’) and blood vessels (sometimes leading to haemorrhage in the retroperitoneal space). Fat necrosis can cause the release of free fatty acids, reacting with serum calcium to form chalky deposits in fatty tissue, resulting in hypocalcaemia. Severe end-stage pancreatitis will eventually result in partial or complete necrosis of the pancreas. Patients will classically present with a sudden onset of severe epigastric pain, which can radiate through to the back, with nausea and vomiting. On examination, there may be epigastric tenderness, but often a soft abdomen with normal bowel sounds. Severe acute pancreatitis can present with signs of guarding and a rigid abdomen, with potential circulatory instability (including hypovolaemic shock). Rarer signs that are often described are Grey Turner’s Sign (bruising in the flanks) and Cullen’s Sign (bruising around the umbilicus), representing retroperitoneal haemorrhage (Fig. 2). Tetany may occur from hypocalcaemia secondary to fat necrosis and any gallstone pathology may also result in a concurrent jaundice or cholangitis clinical picture. There are a wide variety of causes of an acutely painful abdomen, as discussed elsewhere on the site. However causes specifically resulting in abdominal pain that radiates through to the back include symptomatic or ruptured AAA, chronic pancreatitis, aortic dissection, and a duodenal ulcer. The modified Glasgow criteria is used to assess the severity of acute pancreatitis within the first 48 hours of admission. Any patient scoring with ≥3 positive factors within the first 48hrs should be considered to have a ‘severe’ pancreatitis and a high-dependency care referral is warranted. Other risk stratification scores that can be used scoring severity of acute pancreatitis include the APACHE II score, the Ranson Criteria, and Balthazar score (CT scoring system). An abdominal ultrasound scan may be requested if the underlying cause is unknown; it is typically used to identify a possible gallstone, by demonstrating dilation of the bile ducts. Whilst not routinely performed for acute pancreatitis, an AXR can show a ‘sentinal loop sign’. This is a dilated proximal bowel loop adjacent to the pancreas, which occurs secondary to localised inflammation. 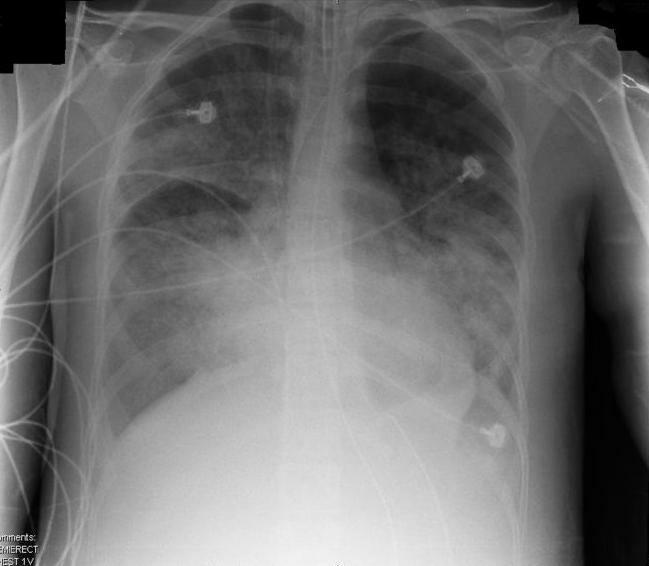 A CXR should be undertaken to look for pleural effusion or signs of ARDS. A contrast-enhanced CT scan (Fig. 3) can be performed if the clinical assessment and blood tests prove inconclusive (or because the severity of clinical presentation raises the possibility of other intra-abdominal pathology). If performed after 48hrs from initial presentation, it will often show areas of pancreatic oedema and swelling, as well as any potential complications that may have developed*. Current UK guidelines state that any CT scan used to assess for severity of disease should only be performed 6-10 days after admission in patients with features of persistent inflammatory response or organ failure*. There is no curative management for acute pancreatitis, so supportive measures are the mainstay of treatment. Treat any underlying cause as necessary (e.g. 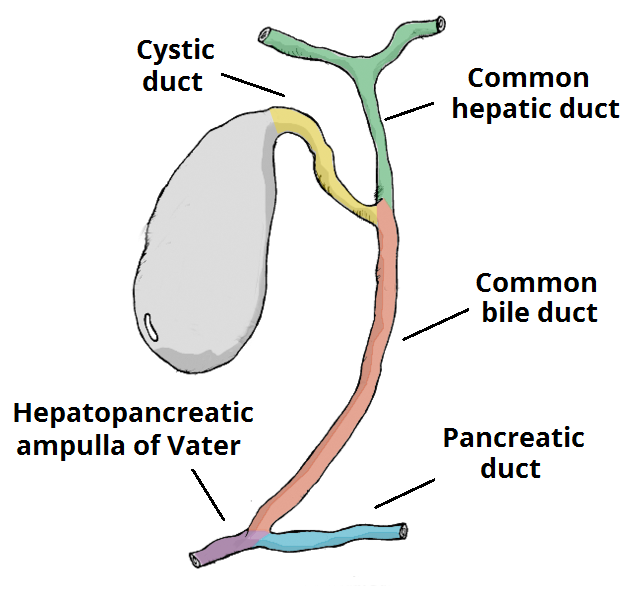 urgent ERCP and sphincterotomy if gallstones are demonstrated within the common bile duct) when deemed appropriate. ACG guidelines recommend 250-500ml/hr of crystalloid solution to be given to all patients (unless cardiovascular or renal co-morbidities) in the initial period, with Hartmann’s solution as the preferred choice of fluid. Current UK guidelines state that all patients with severe acute pancreatitis should be managed in a high dependency unit or intensive therapy unit (although this is often impractical). A broad-spectrum antibiotic, such as imipenem, should be considered for prophylaxis against infection in cases of confirmed pancreatic necrosis, as this has shown a decreased mortality with their use. Many studies have shown that the role of octreotide in reducing pancreatic secretions is minimal and should not to be done routinely. Treating the underlying cause should be addressed, once the patient has been stabilised. For those caused by gallstones, mild cases may benefit from early laparoscopic cholecystectomy, whilst those secondary to alcohol excess should ensure they have referrals / access to the appropriate services made. Ongoing inflammation eventually leads to ischaemic infarction of the pancreatic tissue, hence such progression should be suspected in patients with evidence of persistent systemic inflammation for more than 7-10 days after the onset of pancreatitis. 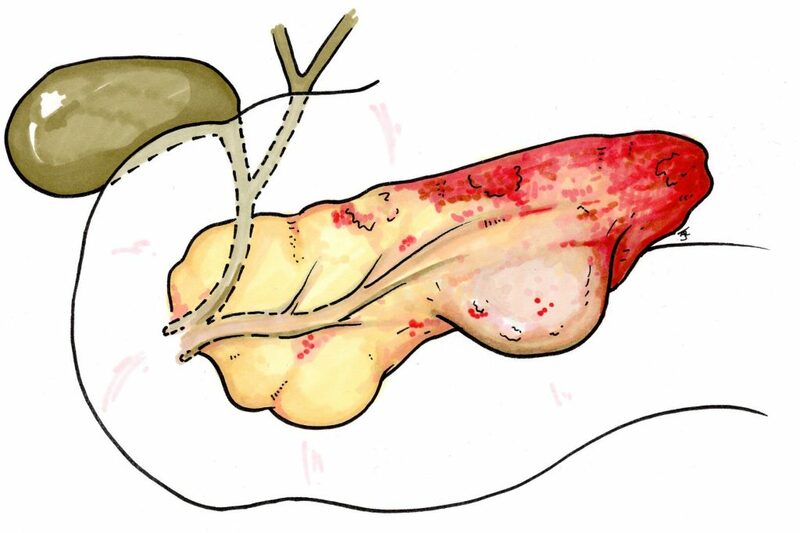 Any suspected pancreatic necrosis should be confirmed by CT imaging and treatment will often warrant pancreatic necrosectomy (open or endoscopic)*. Pancreatic necrosis is prone to infection and should be suspected if there is a clinical deterioration in the patient associated with raised infection markers (or from positive blood culture or changes of low density within the pancreas on CT). Definitive diagnosis of infected pancreatic necrosis can be confirmed by a fine needle aspiration of the necrosis. A pancreatic pseudocyst is a collection of fluid containing pancreatic enzymes, blood, and necrotic tissue; they canoccur anywhere within or adjacent to the pancreas, however are usually seen in the lesser sac obstructing the gastro-epiploic foramen by inflammatory adhesions.. They are typically formed weeks after the initial acute pancreatitis episode. They lack an epithelial lining, therefore termed pseudocyst, and instead have a vascular and fibrotic wall surrounding the collection. Pseudocysts may be found incidentally on imaging or can present with symptoms of mass effect, such as biliary obstruction or gastric outlet obstruction. They are prone to haemorrhage or rupture, and can become infected. About 50% will spontaneously resolve, hence conservative management is usually the initial treatment of choice. Cysts which have been present for longer than 6 weeks are unlikely to resolve spontaneously. Treatment options include surgical debridement or endoscopic drainage (often into the stomach). Which of the following is not a known risk factor for pancreatitis? Which statement about pancreatitis presentation is false? On serum analysis of pancreatitis, which of the following elevated labs suggests common bile duct obstruction? A patient is deteriorating after a diagnosis of pancreatitis was made and CT scan is performed, showing extensive areas of necrosis in the pancreas. Which one of the following is the most definitive next management step? When comparing acute pancreatitis to chronic pancreatitis, which of the following is true about laboratory findings? Amylase and lipase levels are typically lower in chronic pancreatitis than in acute pancreatitis Alkaline phosphatase levels are always higher in chronic pancreatitis than in acute pancreatitis Total bilirubin is always elevated in chronic pancreatitis Alanine aminotransferase (ALT) levels are normal in acute pancreatitis and low in chronic pancreatitis. Which one is true about pancreatic pseudocysts?